The mission design is an invitation for duoing it (one goes north, one goes south). But it is quite easy to solo it, too, especially with witch and/or staff main. Your goal is to destroy all four summon portals and then to kill the boss. During the missions allies will spawn who seem to be able to defend the base on themselves (at least in my run they were able to). I tried this mission now with my alternative character, Fritz, a level 102 musician main. I brought a witch, a sheriff and an oracle. They are well equipped but not uber (meaning: a mixture from freezing+3 down to some Gilgamesh parts, body armor and weapon being the best pieces). I used a blessing potion but no other buffs or titles. Soloing it is definitely possible with this constellation. I followed the advice in one of the comments and killed all monsters in E5, then killing the summon portals in the following order: E8, J8, J3, E3. The sheriff remained in the area of D/E5 to help the allies with the spawned monsters of E3. The reasoning behind letting E3 stand until all other summon portals are down is that the allies have to have their hands full. If there is no opposition present for them they will get crude ideas like going to the center and mess all things up there. Which would result in needless aggro problems. Cross the line - after the enemies are dead. It’s relatively easy with a witch that has it’s lvl 100 upgrades and has lvl 60 meteor shower. All mobs die after one meteor shower in my experience ( a witch with generally +0 freezing equipment). As the primary strike force you will need a seth’ed catapult and witch. I wouldn’t be able to divide my force as you did so first i would take the damage gate (E4), kill the mobs that summons, then go destroy the gate at E8. If you have trouble killing the mobs appearing then make sure you wait till your witch is charged for a 2nd meteor before destroying the summon gate. The allied forces tend to go towards more bottom so I prefer the take J8 as the 3rd gate while allied forces are slowing down the mobs coming from last summon gate. And J3 is the last. Once j3, the last gate is destroyed however you have to attack the next batch of mobs appeared right away because there will be another cutscene and mobs that appeared will get a free turn on you. If you have like 5-10 mins after the last gate then probably you can succeed killing the final boss. A meteor shower to surrounding mobs and fast attacking to boss should be sufficient. In my run I take main (sword), witch, oracle and cannoneer, and usually go reckless with my sword and spring the trap before attacking with witch. Also one side note that do not rely on allied forces as they are comparably weaker that the enemy mobs. They can slow the incoming a bit, and might kill 1 or 2 but overall they will soon be overwhelmed if not helped. Thanks for your comment. I am currently levelling up an alt – when he got his level 100 upgrade I will try this mission again, using your insights. 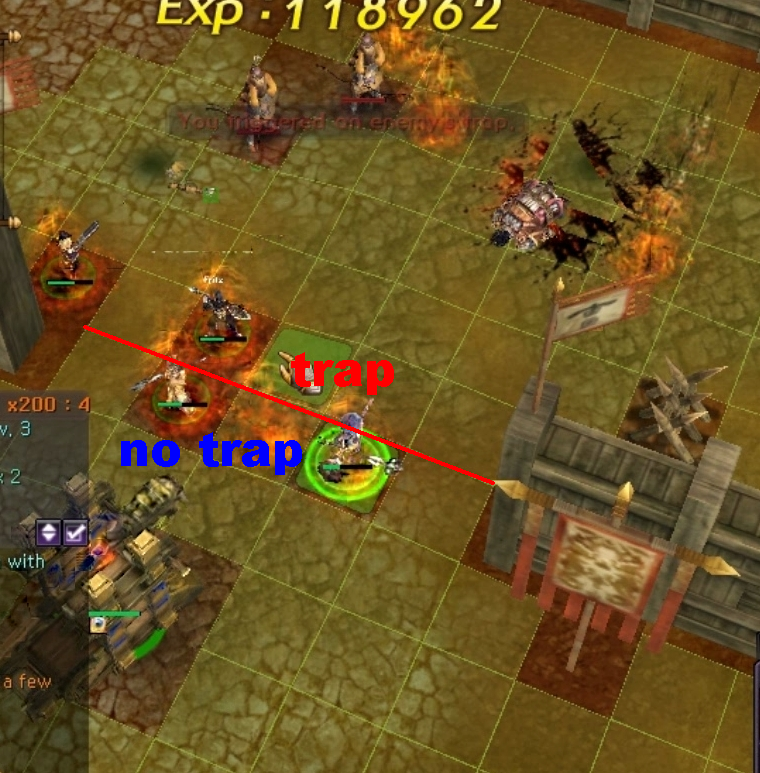 Your map trap is almost all good, only 1 trap that you missed/plant wrong, in j2 there’s 1 trap map, as you notice, but he’s right after the summon portal, not the in space between walls. I normally do E8 – J8 – J3 – E3, the only problem is that arround 3rd gate, everymob that spawns gathers and starts fighting me, i dont know if this happen to you but from what i noticed, instead of going to the base they destroy the barracks and go right after your party you end up fighting 10 mobs at the same time, i normally put my cannonM in front next to inventor and tank with them, while oracle heals/witch waits for meteor/catapult kills mobs that come from the other flank. Thanks for your comments. With all the new content I hadn’t have time to level my alt as fast as I thought I could, so I have to wait a bit until I can rework the map and make an instructive (as in “with realistic gear for level 10x people”) movie. Your party – Sheriff, Oracle and Witch. 1. You start off with killing all the mobs around e5. 2. Destroy the portal at e8. 3. I leave Sheriff to help neutrals, and all others go to J8 and then J3. 4. Last point is e3. I managed to destroy this portal with only a sheriff and neutrals once, but even if not – it’s ok. 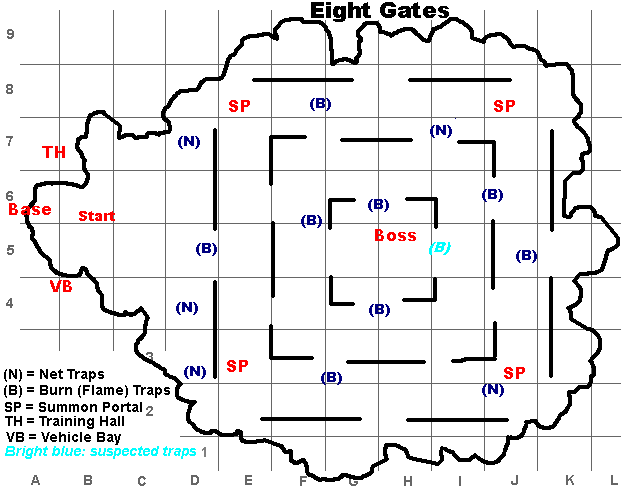 Finish with this gate, and proceed to get the boss, he shouldn’t be a problem. Thanks, tried it. It works like a charm. I have updated the article accordingly. what gear were you wearing? A mixture of Gilgamesh and freezing. Best was freezing+5 instrument (a lucky craft). All else freezing parts were +3 and below. i see, are on argos server by chance? Thanks again for these guides and maps though, they’ve saved me so many times on my runthroughs. Your strategy for this missions is very good. I’ve tried it a few times but I was starting to get a lot of messy fights and i don’t really like that, so I tried a differet strategy – E3, J3, J8, E8. That way there aren’t tons on mobs on the defence part, while main, witch and cata can take care of the other summon portals.